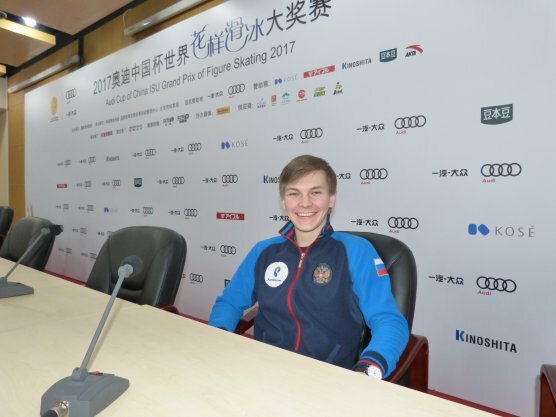 Mikhail Kolyada (22) won his first Grand Prix gold medal at Audi Cup of China and most likely has qualified for his first ISU Grand Prix of Figure Skating Final. Q: Misha, right after the free skating you were a little overwhelmed and didn’t really understand what had happened. Has it now sunk in a little that you won? A: Somewhat, yes. I don’t really remember much from what had happened in the free skating. Q: What were your emotions on the podium? A: I had mixed feelings. I realized that it wasn’t perfect and I knew there is something left to work on and that this is not the maximum. And at the same time I was pleased. It is hard to explain in two, three sentences how it was. Q: Your short program was almost ideal with a great quad Lutz, only the camel spin was not perfect. You cracked a 100 points for the first time, as the sixth skater in the world. What does it mean to you? A: We have worked a lot and achieved this. It is very nice to see that we are going into the right direction. It is clear what has to be done further that everything stays at a high level. Such a skate where I landed everything, I didn’t have in a while, even not in practice. So it is nice that I was able to pull myself together even though there are quite a few strong competitors at the Grand Prix. And I had to skate next to last (in the short). But I was able to ride the wave, I was flying high. Probably like that. Q: How did you prepare yourself mentally? A: As usual. My state of mind was as usual, there wasn’t anything new. I just went out as if it was a practice. Q: Well, that is probably the right thing to do. You have been in different situations before – you had a poor short and then a good long, and the other way round. This time you were in the lead after the short. How did you deal with that? A: Indeed, I didn’t have yet more than 100 points in the short program before. That happened to me for the first time. I never won the short program at a Grand Prix. I did once in the Junior Grand Prix, but never in the senior Grand Prix. Obviously, it was different for me to grasp, that I am first. It was difficult to get into the right mindset, not physically, but to ride that wave again. I didn’t quite do it in the long program. Q: But you fought for it. A: More or less I managed. But two popped jumps – that is inexcusable. I left not a very nice impression. Q: After doubling the Salchow you nailed the triple Axel-triple toe, that was good. A: I got really mad at myself, therefore I went and I did it. Q: What happened when you singled the second Axel? A: I don’t know. You could name a thousand reasons, but I think that it was a fleeting loss of concentration. Yes, I did the quad (toe). Maybe I relaxed. Then this Axel brought me to senses again. I thought – how much can you mess up? Q: But everything else was good and you had a level four for your spins and footwork. A: Well, yes. Many athletes forget that except for the jumps we have spins, footwork and other elements in the programs. Q: There was positive feedback from the judges, because you have the complete package. A: It is nice when judges come up and congratulate. That means something. Q: It looks like you are going to make the Grand Prix Final. How do you feel about that? A: I really like Japan and the Final will be there. It will be another competition. Obviously, for me it is unexpected, but I have to worm my way out of this situation. In order to prepare as necessary, we need to change the training process a little bit. I think it will be an interesting competition. If I make it, then I’ll be in the Final for the first time. I never went to the Junior Final, I only was a substitute. It will be interesting for me to see how everyone is skating and I’ll try to keep up with them. That will be useful. Q: Did you dream about making the Final? A: Deep inside I knew that one day this moment will come. And when, if not now? For me, it is clear. I go there to skate calmly. As for now, I realize it is very difficult for me to compete for a medal. There is only the scenario that I skate great and someone else makes mistakes. But to hope for that is obviously stupid. Q: At the press conference you said that Stéphane Lambiel helped you to get another vision of your skating. Please elaborate on that. A: Usually, when you have been working with someone for a long time, you get used to it – everything is good, you go forward. But when you get the opportunity to compare, because everything in life is learned through comparison, then you start to look at things from a different angle – as for the skating, presentation, everything. That is like in school, when the teacher says something and the children write it down and remember it. And when they go to university, they are told ‘do you know, you can prove that two and two is not four, but five’. And the kids say, ‘How come? For ten years we have been told that it is four’ – and they hear ‘let’s have a look – it is like that and that’. So the awareness is growing. The possibility comes up to look at some things from a different perspective. In figure skating it is probably the same. I have been working for a very long time with my coaches and I did not have the opportunity to compare. After working with Stéphane, I noticed a few things for myself that you can do it this way or that way. And it still looks good. Working with Stéphane gave me a different feeling of the blade and some different emotions. I understood that I can skate not only fun programs, but also lyrical ones. I really enjoyed working with Stéphane and I am very grateful to him. Q: Right now it seems that in men’s skating there is no consistency, even not for the very top skaters like Yuzuru Hanyu. Competition has become a lottery. A: I can explain why this is happening. Before, not so long ago, maybe 15 years ago, it was a little easier with the jumps. You did one quad toe in the short and one or two in the free and that was enough. And that is not that hard. I think that about 50 percent of the participants of the World Championships (2017) could have dealt with this kind of program, but before only a few were able to. Now, as people are including a lot of quads in their programs plus difficult spins, footwork, transitions, choreography and so on it is very hard to get it all together. Therefore it is a bit like a lottery, yes. But that is intriguing. You look at someone and you know he will skate clean with a triple Axel and five triples and there is no suspense. But if someone does quads, you watch and you think will he do it or not? This is the thrill of the competition. Q: But it is not so interesting to watch people falling all the time. A: True. However, all the competitions until New Year are more or less trials. People are trying things – Hanyu tries the quad Lutz for example, Shoma tries the quad loop. Training is so different from competing. At home in practice you can do (quad) Lutz and loop in one program, but when you compete in front of a big audience, it is completely different. Q: You do quad Lutz, toe and Salchow. That is already a lot, but do you think about learning another quad? A: Five different quads won’t happen for me, because my loop is quite bad and my flip is from the wrong edge. And that’s it. I try to do in competition what I can do. I tried honestly to fix the edge on the flip, but it didn’t work. I do the flip from the outside edge. When I started skating, nobody really paid much attention to that – flip is flip, Lutz is Lutz, okay. But then the new judging system came and they started to look at it. When I skated in juniors, one year the flip was the required solo jump and I got the edge call in all national competitions and now all of Russia knows that I have the wrong edge on the flip. Then I went abroad and at Junior Worlds Alexander Lakernik said that it is the wrong edge and now the whole world knows it. So I stopped doing the flip in competition. In practice I can do it, but it is not a real flip. Q: You are always quite upset when you pop a jump and you once said that popping jumps happens in the head – and you compete the way you work. A: Right. I did not work enough on the (quad) Salchow and the Axel in the second half. I admit it is a shortcoming. I will do more run throughs and I will practice parts of the program with music. Q: Sometimes when you pop a jump, it seems like it is a little hard for you to move on. How can you overcome that? A: True, it is sometimes like that. The best way to overcome that is not to pop anything (laughs). Really, when you go for the jump, you rotate and you fall, it is a different feeling than when you pop. I can’t really find words to describe this feeling exactly, but after a fall it is a little easier to get yourself together and do the other elements than after a pop. Of course, the minus is that it affects your breathing, but that is another question. A pop is upsetting, it is inexcusable, I could find many words. Q: You seem to have a very good relationship with your coach, Valentina Mikhailovna Chebotareva. Some athletes argue with their coaches, but from the outside it looks like you never do. A: This is because we are searching for reasons (for failure or success) not in one person. We understand that we win together and we lose together. It is the result of our common work. Obviously I realize a lot of things now and I know my mistakes, but your coach is like your mentor who accompanies you in life, who is always supporting you and knows what to do in a difficult moment to make it easier for you. Q: Is Valentina Mikhailovna a strict coach? A: No, I wouldn’t say so. I don’t remember her being outraged, ever. When I have the feeling that I need a kick in the rear, I will go and tell her. I have nothing to hide from my coach. Q: How did you like China? A: I liked Japan better. The mentality of the Chinese is totally different. And also the ecology, I guess. When you open the window in the hotel you do not smell fresh air, but food. That is weird. It is difficult for me to say, because I did not grow up in the Soviet Union, so I don’t really know, but I think somehow it was similar. I can’t say that this is something bad, I can only say it is unusual for someone who never lived under these conditions. Q: The season is still quite young, but you have done already quite a few competitions. How do you feel you are developing? A: I feel that I am improving with each competition and I feel like I am gaining slowly more confidence. I am always a slow starter into the season. I say honestly that I have prepared better, I am stronger, I have been doing better run throughs and this whole season starts better. I have worked more, maybe I thought about a few things and changed my attitude a bit. With each competition it feels easier to do the long program. I don’t notice any major changes in myself, but I feel that we are going in the right direction. Q: In Moscow you won your first Grand Prix medal, a bronze. What did it mean to you? A: It was nice (laughs). Sooner or later this should happen. I had been waiting for this moment and I hoped for it. I felt a lot of support from the audience and the coaches and I felt stronger. Q: How do you like to compete in one event with top stars like Yuzuru Hanyu? A: To skate with such great athletes gives you another feeling. When you skate in practice, always with the same people, year in year out, it is an every day routine. But when you get into this surrounding, you leave your comfort zone. It is unsual, it is great and it motivates me a lot. Q: Some others might be intimidated. A: No, for me it is the opposite. I want to overdo it, but I shouldn’t. As always the medium way is the best. Q: Some skaters this season return to their old favorite programs. You didn’t. A: To skate the third year the same program? I would not have survived that. Every day the same music, the same motive – I had enough, I couldn’t have taken it anymore. Q: So who had the idea to use Elvis Presley? A: I suggested it. I said why not take Presley? Olga Iurevna Kliushnichenko – our choreographer brought a few days later a composition of different pieces and we picked what we needed and decided to mount the program. I think that it suits me very well. The singer is close to my temperament. I look at him and I understand how he lived, what he felt. Obviously I am not a badass rock’n’roller, but I can get the character and it is understandable for me. Q: Thank you for the interview and all the best for the rest of the season.